NECO’s separate-bed fiberglass (FRP) high purity ion exchange demineralizers are designed for industrial and ultrapure water applications. NECO’s system designs are available for product flow rates of 5-250 GPM. 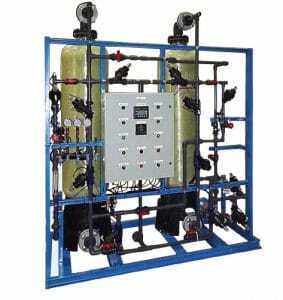 The separate-bed FRP deionization (DI) system offers a corrosion resistant alternative for the economical production of high purity water in industrial applications where DI exchange tank service or reverse osmosis (RO) systems are not ideal. All deionization (DI) systems are skid mounted, pre-piped, pre-wired, and pre-tested for minimal installation time and cost. Duplex alternating systems are available when continuous DI water demand is required. Electrical: 120VAC, 1-Ph, 60 Hz.